Bamboo Fountain with Pump Large 18 Inch Three Arm Style, Indoor or Outdoor Fountain, Natural, Split Resistant Bamboo, Combine with Any Container to Create Your Own Fountain, Handmade | Fountain City Art Ctr. Create a calming water feature for your garden in minutes without complicated, time consuming or expensive installation. Each water spout is carefully hand-made in the tradition of ancient bamboo building, which provides durability and split-resistance. The three arm spout is ideal for bringing tranquility to your office garden or desk. Personalize your indoor or outdoor relaxation and meditation water sound. Anything from a Zen-style water bowl to a hidden mountain stream. Insect Free - Our bamboo poles are pressure treated with non-toxic borax that eliminated the possibility of insect infestations. 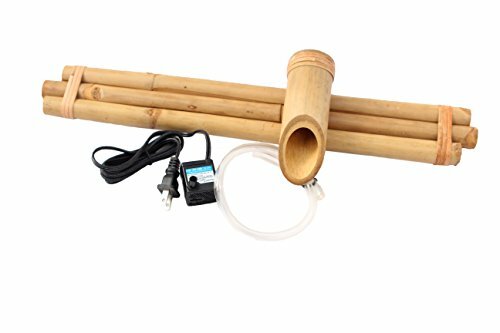 EASY INSTALL: Complete kit includes sump pump, tubing and bamboo fountain. Start hearing the calming sound of running water in just minutes. This size fits on the edge of a 15" to 30" diameter container. SPLIT FREE BAMBOO: Each spout is handcrafted from solid Tam vong bamboo by our artisans who have preserved the techniques of ancient bamboo craftsmanship for generations. If you have any questions about this product by Bamboo Accents, contact us by completing and submitting the form below. If you are looking for a specif part number, please include it with your message.